FlokiBot: A Flock of Bots? In early October, Flashpoint released an analysis of an underground forum advertisement for a new malware family known as FlokiBot. It took some time before a sample was found in the wild, but a researcher known as hasherezade flagged one on VirusTotal in early November. She also wrote an analysis of its dropper here. This post takes a look at our analysis of FlokiBot so far. This particular sample is version 12. FlokiBot’s versioning differs from other variants as it doesn’t map to the traditional a.b.c.d format—e.g. 0x02000809 to 2.0.8.9. The C2 is highlighted in red and the other non-\x00 chunk of data is a 258-byte encryption key that will be used to protect C2 communications. 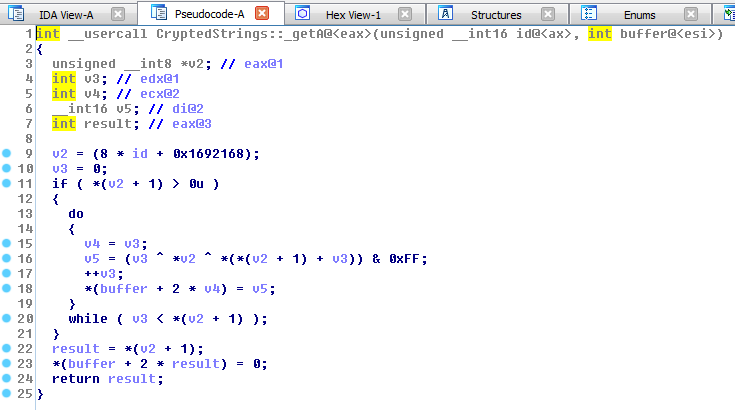 The second round of encryption uses the 258-byte key from the base config. This key is actually an “S” value generated by RC4’s key-scheduling algorithm (KSA). It is used with RC4’s pseudo-random generation algorithm (PRGA) to encrypt the visual encrypted data. Traditionally Zeus would send this encrypted binstorage via HTTP POST requests to the C2, but FlokiBot changes things a bit. This newly packaged binstorage is then encrypted as above with visual encrypt and RC4. Depending on the type of communication, the encrypted data is also encoded using base64 before being sent to the C2 in an HTTP POST request. Also depending on the type of communication, the response from the C2 is handled differently—more on this below. At the time of this writing, all the C2 URLs that we have seen have used HTTPS. Additionally, there is also code to check for .onion based C2 URLs and if that is the case, it routes the C2 traffic through a local TOR proxy. Most of these (SBCID_Xs) are generic Zeus types and more information can be found in the leaked source code. This data is packaged up as described above and sent to the C2 without the additional base64 encoding. 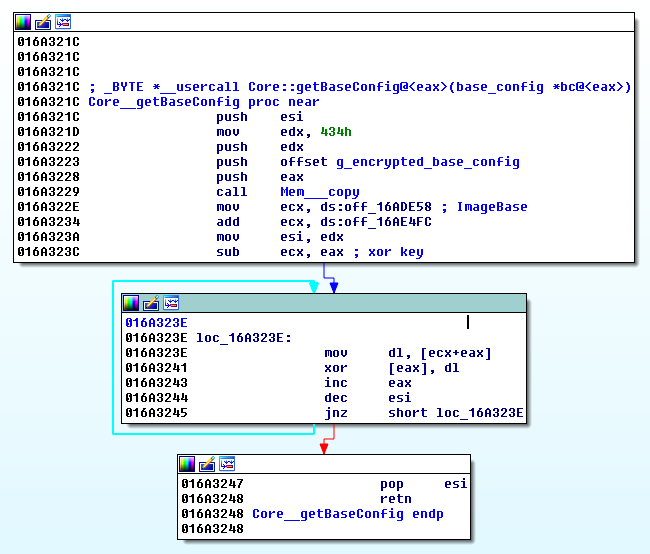 On response, the data is first decrypted using RC4 and visual decrypt. Next, a chunk of data is unpackaged from the newly added header (as described above). This data can be separated into two pieces: a command byte and command data. There is a second code path in FlokiBot to Zeus' DynamicConfig::updateConfig function (see leaked source code), but it feels like a work in progress—something still being developed maybe. It creates one binstorage section of type 11003 which stores a “1” in a DWORD. 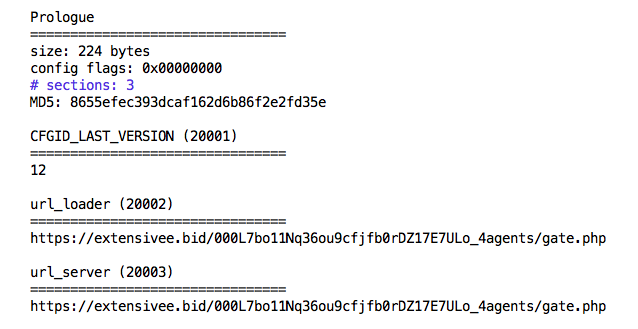 It is packaged and encrypted as above, but encodes the encrypted data with base64 before sending it to the C2 server. On response from the C2, the data is decrypted and unpackaged as above. At the time of this writing the only response we’ve observed is a command byte of “2” and an empty plaintext binstorage as command data. Noticeably absent from the example dynamic config above are webinjects. While a deep-dive of the man-in-the-browser (MITB) implementation wasn’t done for this analysis, glossing over the code suggests that it is the standard Zeus implementation. The lack of webinjects in this example is likely due to the specific campaign/version we analyzed not using them yet. Based on trends of other Zeus variants though, we expect to see webinjects when/if new FlokiBot campaigns/versions appear in the wild. Past research on Zeus Gameover suggest that its operators used DDoS functionality to attack banks while they were stealing money from them as a way to distract them from the heist. It’s too early to determine if this is the same idea behind FlokiBot’s DDoS functionality. Regardless, Arbor customers have countermeasure available to mitigate these attack should they be targeted. FlokiBot is a new Zeus-based banking trojan variant that is being sold on underground forums for a hefty price ($1000) and recently started appearing in the wild. Its “killer features” seem to be a slightly modified C2 protocol, basic DDoS attack functionality, and a basic credit card memory scraper. It is too soon to assess how active and widespread this new variant will become, but coincidently during the writing of this post, a new version (13) appeared in the wild. ASERT will continue to monitor this threat to see if FlokiBot becomes a flock of bots.